I started this blog to share some of the insights and experiences from my thirty plus years of teaching speed reading–the little successes of my students that add up along with their major victories have fueled my passion for what we do here–and are worth sharing. I’ve had the good fortune to meet some extraordinary and interesting people from all over the country– in my summer school and public courses, classes for corporations, the government and the military and in networking events. I hope you enjoy their stories. I have seen the results of early reading experiences in these teens and adults –the good, the bad and the ugly. Therefore, I have some really strong opinions on what helps people become good readers and what cripples their ability to read and sometimes their egos. I will be sharing those as well. I hope that you will feel their joys and pain through my words . Maybe you can use these experiences to help others or just to understand them better. We will post pictures from our courses and testimonials from our students (who have given permission to do so)–and any other pictures we find amusing! The story behind the cat picture is this: My office is in my home; we have cats; they are very interested in what we do and “help” us as much as possible. So, if you don’t hear from me in a timely manner, your business card was knocked on the floor, and I haven’t found it again yet. 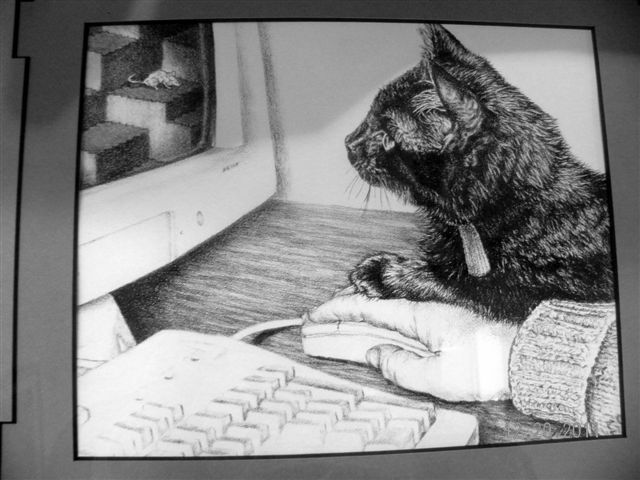 My artist sister, Marcia Abbate, drew a picture of Buddy helping me with my mouse at the keyboard. It sort of says how the office work gets done here. Aside | This entry was posted in reading classes, reading improvement, speed reading, speedreading, testimonials, writing organization and tagged adult learners, Columbus, corporate classes, good readers, government courses, military courses, Ohio, public courses, reading improvement, speed reading, speedreading, student learners, writing organization. Bookmark the permalink. I like your first blog. Very nice! Reblogged this on Speed Reading Plus Blog!.